HI DEAR READERS AS YOU KNOW THAT THERE IS A UPCOMING HARDFORK IN ETH NETWORK SO TODAY WE EXPLAINED ABOUT HARDFORK AND ETCV IN OUR LATEST ARTICLE. The Ethereum Classic vision is an open-source, peer-to-peer, computing platform based on blockchain technology and the original Ethereum code. On like Ethereum, it provides a value token, or “altcoin”, called “classic ether” which is used to pay users for products and services, and as a transaction fee when using decentralized apps and smart contracts. Scaling. Ethereum recently processes only fifteen transactions per second, and long backlogs of transactions often form in the network. And since the Ethereum blockchain can only process one payment at a time, its total capacity is only as large as that of each computer in the network. Increasing the number of nodes cannot solve the issue, and as the number of transactions increases,processing times wil lincrease and gas fees will rise. The solution is to switch from the Proof-of-Work consensus algorithm toProof-of-Stake (see below), but the transition is constantly being delayed, and there is no indication of when it will happen. Difficulty bomb. A very special piece of code has been introduced into Ethereum,making it progressively more difficult and less efficient to produce new blocks. But eventually it will become so inefficient and unprofitable that miners will abandon Ethereum and switch to other cryptocurrencies. All the operations within the Ethereum network will cease (this is known as the Ethereum ice age). The purpose of the difficulty bomb is to stimulate the transition to PoS; however,seeing as developers can not reach an agreement on when and how to execute the switch, the“iceage”is becoming an evermore probable scenario. Declining rewards. Miners’ rewards have been in decline fort he past year due torising complexity, a slump in cryptocurrency prices, and excessive control acquired by large mining pools. The leadership team of Ethereum has made the situation evenworse:in an attempt to make the network more efficient and win some time for the transition to PoS, the decision to decrease block rewards to 2ETH was made, provoking the anger of most miners. The Ethereum Classic Vision aims to resolve the major issues facing Ethereum, including scaling, mining inefficiency, and high costs of data storage. 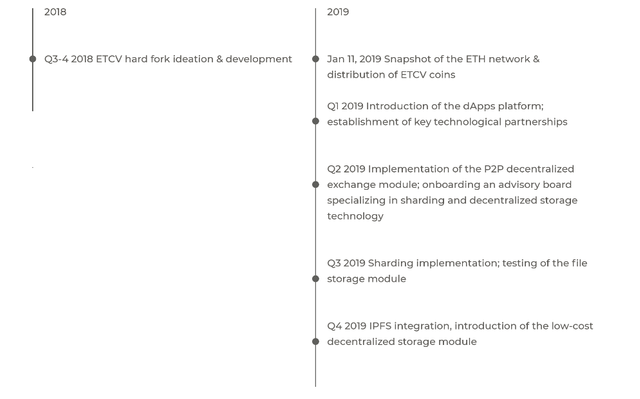 The transition to Proof-of-Stake, described in Chapter one constitutes the key element of this plan, but a number of additional modules and features will also play an important role. This part introduces the solutions proposed by Ethereum Classic Vision, their advantages, and implementation plan. Energy efficiency. The PoW-based blockchains are notoriously inefficient when it comes to electricity. The bitcoin mining itself consumes 0.33% of the global energy usage-more than the whole country of Denmark (or any of other 150 countries, including most states of Africa). Electricity spent on just one bitcoin transaction could power an average household for a whole month. A Fair distribution of rewards. Proof-of-Stake networks do not have block rewards–they offer only transaction fees to validators.While these are naturally lower than the standard block reward in ETH or BTC, the result of long-term profits can be compared to those obtained with PoW, since operational costs are so low. As a result, even a user with a basic $40 Raspberry Pi computer can become a validator, as long as he or she stakes enough coins (which will come out much cheaper than buying a miningrig).All users are put in equal conditions when earning rewards with a PoS system like Ethereum Classic Vision. Decentralization. If Ethereum and Bitcoin claims to be decentralized, they are not. The creation of new coins in itself is evermore concentrated in the hands of large mining pools (according to some data,51% of the Bitcoin has hrateis already controlled by pools, with over 40% owned by Bitmain alone) .Independent miners without access to one economy of scale have all but lost hope to compete with large rights. The goal of ETHEREUM CLASSIC VISION is the solution of the basic problems faced by Ethereum, including scaling, the inefficiency of mining and the high cost of data storage. The transition to Proof-of-Stake is a key element of this plan, but a number of additional modules and features will also play an important role. Tokens company ETCV will be distributed free to owners of ETH 11 Jan 2019. Over the next few months, ETCV will be included among the major cryptocurrency exchanges (the project team is currently negotiating with several of them) and will be launched in its dApp development environment, where blockchain startups will be able to create and deploy new services, adding their assets to a specially created P2P exchange-Vision DEX. All Ethereum holders will receive 3 ETCV for each ETH in their wallets. Each ETH holder receives ETN in the ratio of 1:1 for free. 16.01.2019 Constantinople Mainnet hard fork scheduled for block 7080000. The Constantinople Mainnet hard fork is arguably the most significant fork because it is a big component of Ethereum’s transition from using a proof of work protocol to proof of stake. *ANOTHER GOOD BINANCE IS #BINANCE WILL SUPPORT ETH UPCOMING HRD FORK AND ITS REALLY VERY GOOD DICISION AND WE HOPE THEY WILL ALSO START TRADING.